All that we are arises with our thoughts." What do you use for the clock and stuff on the right side? Like you, I use the weather and Evolution Tasks enabled with system time on the task bar. Why did you put a weather app on the desktop? No reason I like it that way. I tried KDE widgets they are not as good looking as the Gnome screenlets. Have you tried using different KDE desktop themes. Gnome has stock themes and you can customize them for colors, fonts, controls, borders?, etc. No I'll stick to Gnome for now. 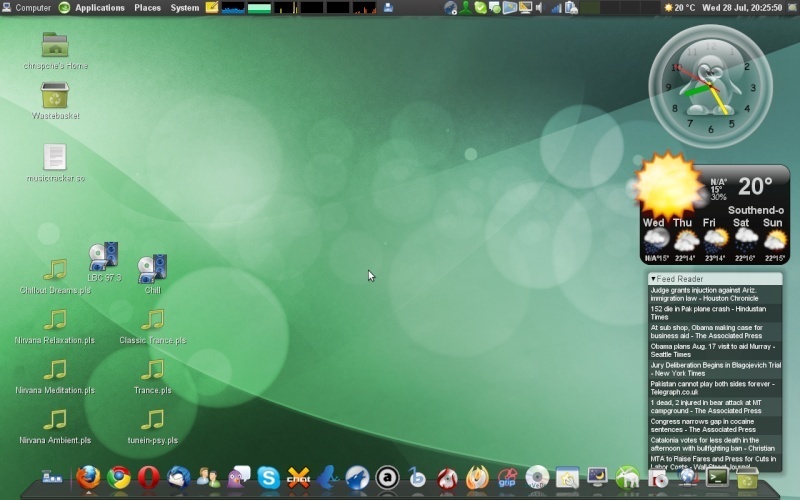 I can spot screenlets, amarok from KDE3, what looks like cairo-dock. It's a desktop that shows openSUSE in a good light because it defuses the binary argument that says you must choose one or the other desktop exclusively. Furthermore, it shows something that I encourage, which is tweaking your system, as opposed to arguing about which distro or desktop looks best out-of-the-box. My desktop is similar, even down to the preferred apps; one thing you might like if it isn't already there and hidden, is the Yakuake drop-down terminal (from KDE4) which works well under Gnome.